Brief Description: Calling all football fans – so you think you know everything about the Premiership? Now might be the time to think again! For instance, do you know your Hornets from your Robins? What about team sponsors, trophies, shirt manufacturers, stadiums, squad numbers, awards, transfers, relegations and who won what, where and in what year? Containing a wealth of information and 2,000 fiendishly challenging questions for both the novice armchair enthusiast and the most knowledgeable of football aficionados, this quiz book could well result in more home goals than golden ones! What is guaranteed is that it will keep the whole family both entertained and perplexed for many an hour. With a fitting Foreword by the much-loved Eamonn Holmes, this quiz book is an absolute must for anyone with a keen interest in the sport. It is equally an excellent reference book of footballing facts and figures, stirring up fond recollections of some of the major events and personalities in the Premiership’s history. Special Note: £1 from every copy of the book sold will go to 'The Elizabeth Hardie Ferguson Charitable Trust Fund' which in turn will benefit many Charities. This book is also available as an ebook. Congratulations! The book is very interesting and a great test for the most knowledgeable of football fans. The research to put this book together is a credit to all concerned. 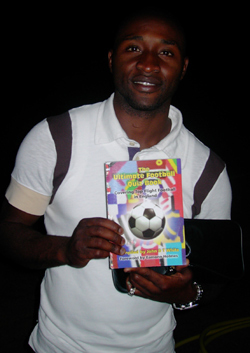 (Photo: Lomana Tresor Lua Lua holding 'The Ultimate Football Quiz Book'). Not only a great read with thousands of questions but hopefully it will also raise a lot of money for charity. A cracking book! I loved the way that the questions were arranged into categories. I found from reading through the questions that John DT White's knowledge of football as infinitely greater than my own. It supplied me with days of entertainment. A well produced collectors item. Like me, and you John White is a fanatical football fan. I first met John when he asked me to be the President of Carryduff Manchester United Supporters Club, which he set up in 1991 and what a year it was - we won the European Cup Winners’ Cup & European Super Cup. I have attended several functions organised by Carryduff Manchester United Supporters Club and attended games at Old Trafford with the boys and have always been impressed with their professionalism and commitment to United. So when John asked me to write the Foreword to this Book I was more than happy to accommodate a fellow Red, a fellow Irishman and a fellow Carryduff resident. Although the Premiership only began in 1992 we have witnessed so many wonderful players, games and seasons during its 12-year history. Naturally I have many fond memories myself from Manchester United’s first Premiership Championship success in 1993, our first Double in 1994 and I will never forget our Treble-winning year of 1999. There have also been many wonderful overseas stars to have graced what must arguably be the best League in the world and certainly one of the most toughest to win. Football legends such as Jurgen Klinsmann, George Weah, Gianfarnco Zola and Eric Cantona have all lit up British football with their own magical blend of creativity and genius. Indeed, looking around the Premiership today we can see world class players at almost every Club. Players such as Patrick Vieira, Ruud van Nistelrooy, Jay-Jay Okacha, Wayne Rooney, Thierry Henry and Roy Keane thrill us week in and week out with their determination, drive and will-to-win. The Premiership is full of dreams as any Club can beat another, as has been proved all too often in the past, on their day. There is no doubt that the Premiership is the place to be whether you are a Manager, a Player or a Fan and with the money poured into the game by Sky tv, our League is set to entertain us for a long time to come. So I hope you enjoy John’s Book as much as I did. Reading it tested my own memory of events over the years. It helped bring back memories of some good times, some not so good times and the occasional “Oh, I forgot about that”. The Book is a trip through the 12 seasons we have had so far and is a must for all football fans. 12 wonderful years of Premier League memories in one book. These 2,000 questions are sure to please all football fans regardless of what team they follow. So if you think you know all there is to know about the greatest league in the world then read this book and test your own knowledge to the full. Finally, I am delighted that John and Apex Publishing Ltd have agreed to donate £1 from every copy of the book sold to The Elizabeth Hardie Ferguson Charitable Trust Fund wich in turn will benefit many Charities. (Picture: Sir Alex Ferguson CBE, holding a picture of the front cover with John DT White). 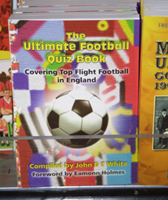 John's book is a must have football quiz book for all football fans. It covers just about everything in the Premier League as well as the FA Cup, Charity Shield & League Cup. I enjoy football quizzes and this book is sure to please. I really enjoyed this book from first page to last. It's packed full of trivia, some of which even had me scratching my head and I have been in the game a long time. Well written and well laid out; all in all a very enjoyable read. What A good read. Over 2000 questions from just 12 seasons of Premiership football, some of which will help to solve a few arguments. Good for young, old, anoraks and the casual supporter. It is nice to be reminded of the stars, events and games of what has been a wonderful period for English football which has firmly established our League as the most competitive in the World. For someone who has been around as long as me there are facts in this book which even I did not know. 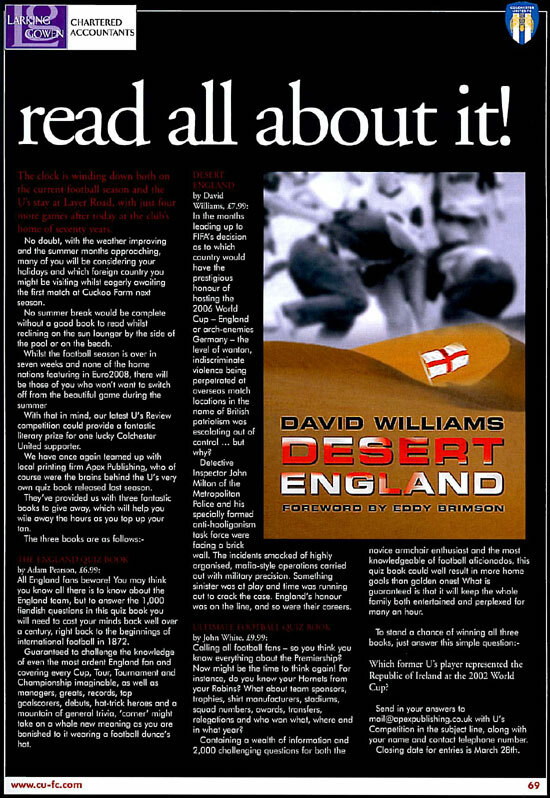 Packed full of interesting facts, figures and information, certainly a must read for all football fans. Hours of fun for the more discerning soccer nut, a throughably enjoyable read. 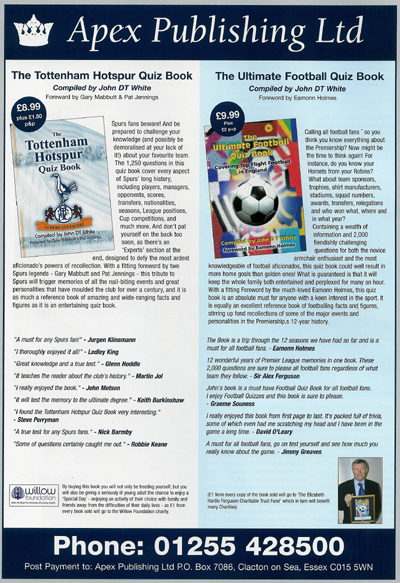 It is with great pleasure to write a testimonial for the ‘The Ultimate Football Quiz Book’. I have no doubt that any football supporter will be 'tested' as I was with the questions in John's book and I am sure that it will be a great topic of conversation/debate in homes, schools, pubs and clubs. It certainly gets fans talking. 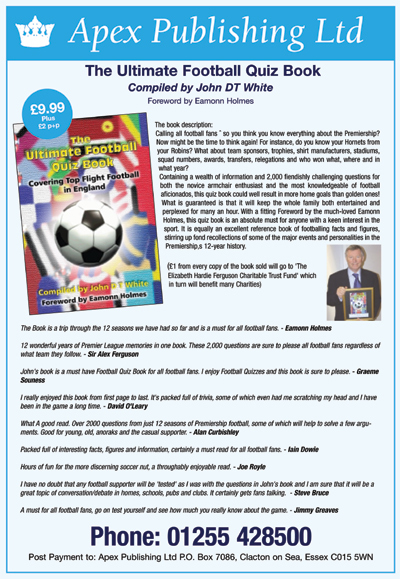 The Ultimate Football Quizbook is a must have for every football fan and really will find out whether your knowledge is of Premiership standard, or merely Football Conference. Just like managing a team at the top level, this book puts you under pressure to get things right, but with good teamwork and strong concentration success is within your grasp. It's a real treat for football fans of any age, I thoroughly recommend it but do suggest that you prepare for some serious brain work once you've got your hands on a copy of your own! A great compilation of questions which will tax anyone that is football orientated and I am sure you could spend many enjoyable hours pitting your wits and trying to find the answers. This book will test the best sports brains around. The football quiz is a tremendous idea. Great for fans all over the country and good for players on away trips to test their knowledge. A must for all football fans, go on test yourself and see how much you really know about the game. This is a must for any true football fan packed wiv over 2000 questions, this is truly a great quiz book. This is one of the most comprehensive football quiz book's I've seen. It will certainly test the minds and memories of football fans around the country. It should provoke many hours of discussion amongst everyone and also surprise the most knowledgeable of supporters. Excellent. At last an imaginative football quiz book which you can dip in and out of and never get bored. Love it! Perfect for a long journey with friends and a must for the smallest room! I have known John since he formed Carryduff MUSC in 1991 and I am aware that he does a lot of work for Charity so it is nice of him to donate £1 from every copy of this book sold to The Elizabeth Hardie Ferguson Charitable Trust Fund, a Trust Fund set up by the Boss himself, Sir Alex Ferguson. I wish John much success with his book. Everybody from young and old has an opinion on football, they all want to tell you what a player or manager should be doing, when dealing with young and upcoming players the dads would always tell me what a premiership manager would be doing with his son - I would like to line all these so called opinionated experts up, stick a television camera up their nose and fire questions from this book at them - the winner can manage England for a game. This book promises questions and delivers: 2,000 questions covering the first 12 years of the Premiership since 1992. Some are easy, but most are not. Some examples: From which club did Chelsea buy Arjen Robben? Who was the manager of Birmingham City in 1993? A nice gift for any Premiership addict. Think you know all there is to know about the beautiful game? The Ultimate Football Quiz Book will provide you with the answer. 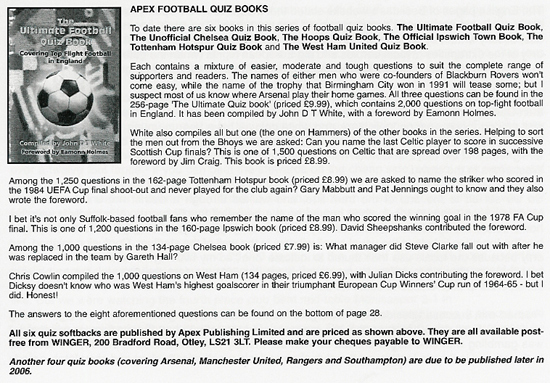 Football 1st Pools are pleased to be working with Apex Publishing Ltd, who have agreed to give a few copies of some football related titles away for a competition we are running until September 2005. All of these books have fantastic reviews, both by magazines and famous stars, and are a great read. Managers and players have even bought their own copies of this book which contains 2,000 questions covering the first 12 years of the Premiership. You should be able to answer many of the posers set by author John DT White if you read this edition of Shoot carefully! The Ultimate Football Quiz Book: Covering Top Flight Football in England. 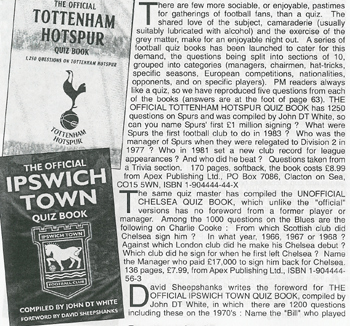 'The Tottenham Hotspur Quiz Book' and 'The Ultimate Football Quiz Book'. 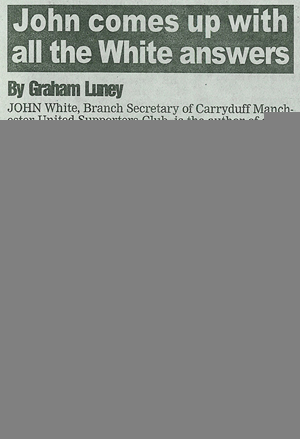 JOHN White, Branch Secretary of Carryduff Manchester United Supporters Club, is the author of a new quiz book covering 12 years of the FA Premier League. White, who is also the Northern Ireland co-ordinator and fundraiser for Sir Alex Ferguson's charity, The Elizabeth Hardie Ferguson Charitable Trust Fund, has compiled 2,000 questions in the book covering the 37 teams that have played in the top flight. One pound from every copy of the book sold will go towards the Trust Fund and the cash will be spent on bringing Catholic and Protestant kids together through sport. White has written several quiz books covering golf, snooker, tennis and Formula One. However his latest publication has been applauded by Sir Alex and Belfast-born TV presenter Eamonn Holmes. Holmes, who agreed to write a foreword for the book, said: "John White is a fanatical fan. "I first met John when he asked me to be the President of Carryduff Manchester United Supporters Club, which he set up in 1991 and what a year it was - we won the European Cup Winners' Cup and European Super Cup. "Although the Premiership only began in 1992 we have witnessed so many wonderful players, games and seasons. "This book is a trip through the 12 seasons we have had so far and is a must for all football fans." Manchester United boss Sir Alex Ferguson added: "I am delighted that John and Apex Publishing Ltd have agreed to donate £1 from every copy of the book sold to The Elizabeth Hardie Ferguson Charitable Trust Fund." 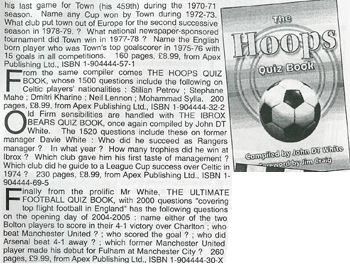 A2zsoccer has managed to get hold of 5 copies of "The Ultimate Football Quiz Book", another fantastic publication from John White and Apex Publishing. The book gives you the perfect opportunity to test your friends on how much they really know about their favourite team in the Premiership. Everything is covered in this excellently compiled production from who was the top marksman in 2003/4 to the transfer dealings of Arsenal. To be in with a chance of winning a copy, we have selected a question out of the book for you to answer. Which club did Stephen Carr leave Spurs to join at the start of last season? The book's foreword is provided by TV personality and Manchester United fanatic, Eamonn Holmes: "The Book is a trip through the 12 seasons we have had so far and is a must for all football fans." Meanwhile, the book is also praised by the man who led his side to Premiership glory on more occasions than anyone else: "12 wonderful years of Premier League memories in one book. These 2,000 questions are sure to please all football fans regardless of what team they follow. So if you think you know all there is to know about the greatest league in the world then read this book and test your own knowledge to the full. Finally, I am delighted that John DT White and Apex Publishing LTD have agreed to donate £1 from every copy of the book sold to The Elizabeth Hardie Ferguson Charitable Trust Fund which in turn will benefit many charities," said Manchester United boss Sir Alex Ferguson. 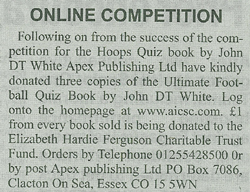 Following on from the success of the competition for the Hoops Quiz book by John DT White, Apex Publishing Ltd have kindly donated three copies of the Ultimate Football Quiz Book by John DT White. Log onto the homepage at http://www.aicsc.com. £1 from every book sold is being donated to the Elizabeth Hardie Ferguson Charitale Trust Fund. Orders by Telephone: 01255 428500 or by post: Apex Publishing Ltd, PO Box 7086, Clacton on Sea, Essex, CO15 5WN. The lucky winners of our 'Ultimate Football Quiz Book' competition were Pascal Keys, Kylemore Park, Gabriel Campbell, Elaghmore Park and Peter O'Donnell, Drummond Park who correctly answered that Stephen Kenny managed Bohemians before coming to the Brandywell. 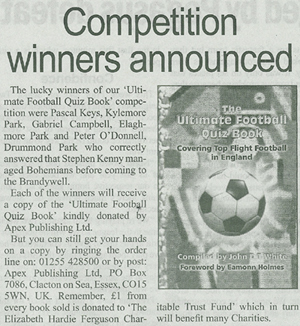 Each of the winners will receive a copy of the 'Ultimate Football Quiz Book' kindly donated by Apex Publishing Ltd. But you can still get your hands on a copy by ringing the order line on: 01255 428500 or by post: Apex Publishing Ltd, PO Box 7086, Clacton on Sea, Essex, CO15 5WN, UK. Remember, £1 from every book sold is donated to 'The Elizabeth Hardie Ferguson Charitable Trust Fund' which in turn will benefit many Charities. 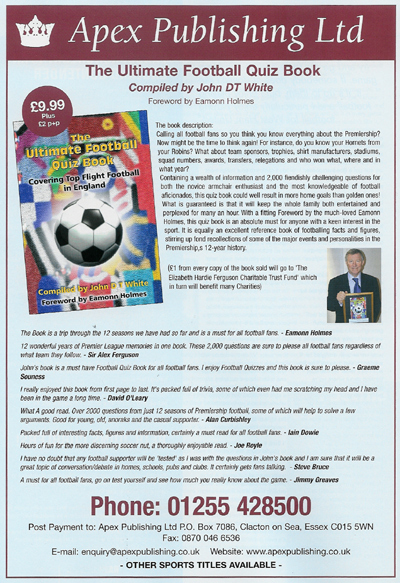 The Derry News has three copies of the new book 'The Ultimate Football Quiz Book' to give away courtesy of Apex Publishing Ltd, Compiled by John DT White, Foreword by Eamonn Holmes, this publication is a must-have for any self-respecting football fan. To get your hands on a copy simply answer this question and send your entries to the Derry News, 26 Balliniska Road, Springtown, Derry, BT48 0LY. Which club did Stephen Kenny manage before he came to Derry City? £1 from every book sold is being donated to 'The Elizabeth Hardie Ferguson Charitable Trust Fund' which in turn will benefit many Charities) Orders by telephone: 01255 428500 or by post: Apex Publishing Ltd, PO Box 7086, Clacton on Sea, Essex, CO15 5WN, UK. 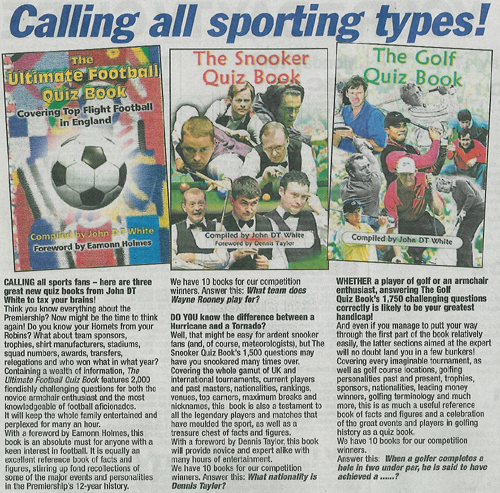 The South Belfast News has two copies of the Ultimate Football Quiz Book to give away. Just e-mail g.magee@irelandclick.com with the answer to the following question and leave your name and a phone number. Q) Name the Man Utd player who failed to score from the spot in the penalty shoot out against Arsenal in Saturday's FA Cup final? 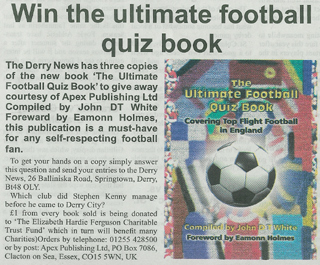 The North Belfast News has two copies of the Ultimate Football Quiz Book to give away. Just phone the North Belfast News (90584444), before 10am on Friday, May 27 with the answer to the following question and leave your name and contact details. This book is an absolute must for the football enthusiast. If you love the Premiership, and the First Division before that - test your knowledge with "The Ultimate Football Quiz Book". You'll find yourself remembering things you'd forgotten about years ago... it's perfect for shutting up your mates! Think you know all there is to know about the beautiful game, you wished! John's book has a great variety of questions which will really put you to the test, a must for all football fans! 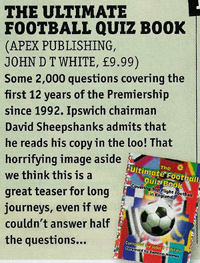 John's book is packed full of up-to-date questions, challenging even the die hard football fans. Think you know your footy, just the test you need! It’s a must for all ages. Just what you need on the bus to matches, or when you get together at home or in the pub to watch the match, or you just fancy a browse... includes questions for everyone. How much do you really know? A great journey back through the years of the Premiership. Questions which will keep the young and old on their toes and it provides a terrific reminder of some of the key events from years gone by. A great read. Great fun for football fans everywhere, we tested it out on many of our 60's & 70's stars and even they were baffled on a few questions. This brilliant football quiz book features about 2,000 questions, which should keep any football fan busy for at least a few hours. 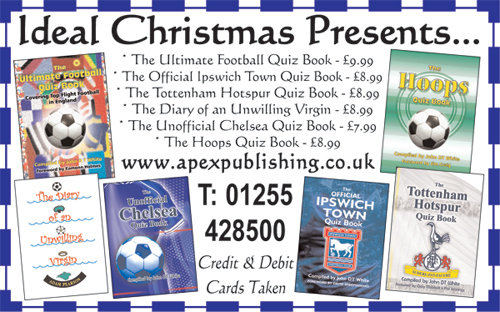 A book full of football questions and facts, and every copy of this book sold, £1 is donated to . The Elizabeth Hardie Ferguson Charitable trust Fund, which benefits all of Sir Alex Ferguson’s charities. 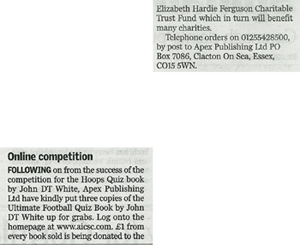 Colchester Garrison 107 FM reviewed 'The Ultimate Football Quiz Book' compiled by John DT White, 'The England Quiz Book' compiled by Adam Pearson and 'Celebrities' Favourite Football Teams' compiled by Chris Cowlin on 'The Danny Lawrence Breakfast Show', they also gave copies of the books away in a radio competition. 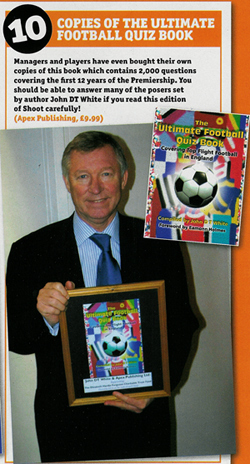 Manchester United Television featured and ran a competition on 'The Ultimate Football Quiz Book' compiled by John DT White. Perfect for the real football fanatic. It will provide plenty of banter, arguments and talking points between supporters, both on and off the terraces all over the country. A wealth of questions that keeps me and my son wracking our brains for hours on end. A God-send for journeys with a nine-year old football fanatic!! Great!! Think you know a lot about the Premiership? I thought I did until I read John's book, a truly amazing journey through the premier league in the world. This book is certain to evoke a memory for anyone who has watched a premier league match during the past 12 years. It will undoubtedly increase your knowledge of the game, no matter how much you thought you knew. Having spent many a dull hour travelling to watch Manchester United home and away, both domestically and in Europe, this book would make the ideal read to while away the long hours and test your football knowledge. John obviously knows his onions and these teasers will keep you going for many an hour. This is a "must have" book for any football fan. I will have loads of head scratching testing my mates on their soccer knowledge. 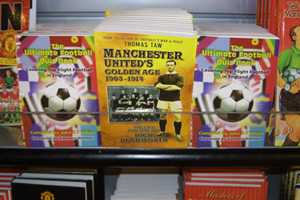 'The Ultimate Football Quiz Book' on sale at Manchester United Super Store.